During times of economic and political uncertainty, Americans are more likely to vote, according to a new book by two Rice University political scientists. The researchers also found that when there's less uncertainty, many Americans stay home on Election Day. In "The American Nonvoter," Lyn Ragsdale, the Radoslav A. Tsanoff Professor of Public Affairs and a professor of political science in the School of Social Sciences, and Jerrold Rusk, a professor of political science in the School of Social Sciences, examine how uncertainty regarding changing economic conditions, noteworthy national events and U.S. international interventions influence people's decisions on whether to vote in presidential and House elections from 1920 to 2012. "When it comes to pocketbook or business decisions, uncertainty tends to cause people to stay on the sidelines and spend less money," Ragsdale said. "However, we've found that exactly the opposite happens when it comes to politics. People go to the polls when times are uncertain— whether it be uncertainty about the economy, international politics or something else entirely. People engage with uncertainty." Politically ignorant: These individuals pay little attention to the national campaign context and the candidates' campaigns. They gather little specific information about the campaign or candidates and form few concrete judgments about the candidates. With little basis upon which to evaluate the candidates, these individuals are unable to decide for whom to vote and which candidate would be best because these individuals' knowledge of the national campaign context does not rise to a level sufficient to acquire candidate opinions. Indifferent: These individuals gather some information about the national campaign context and the candidates but are unable to make clear comparisons between the candidates. Unlike the politically ignorant who do not form opinions about the candidates, the indifferent are more likely to have impressions about the candidates but see little difference between them. Dissatisfied: These individuals may pay a good deal of attention to the uncertainty in the national campaign context and gather information, but one or more of the candidates may be evaluated negatively. As a result, the individuals do not vote. Rather than vote for the candidate they dislike the least, these individuals stay home. Facing personal hardship: These individuals do not participate in elections because they face key personal challenges that make it difficult to vote. They may have some information about the national campaign context and have opinions about the candidates, but the personal hardship prevents them from voting. "We found that most nonvoters are as politically knowledgeable as voters, but see no difference between candidates or view them negatively," Rusk said. "Only the politically ignorant nonvoters resemble the stereotype." 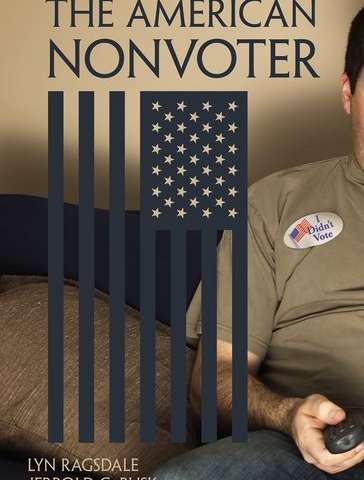 The authors hope that the book will shed light on voter participation in the U.S.